Have you ever wondered how some people get that perfect shot of their meal to upload to Instagram? Perhaps, your photo opt of your delectable delight is less than post worthy. Thankfully, there are some easy tips you can follow to take your food photo game up a notch the next time you photograph your amazing dish. According to a New York Times article, one of the main problems with photographing your food in a dimly lit restaurant is bad lighting. While the ambiance created by candlelight dining is ideal for your romantic relationship, it will wreak havoc on your photos. Thankfully, you can easily remedy this problem by employing the use of another phone. Have your significant other, or friends use their phones to illuminate your plate briefly so you can get a well-lit photo. This will enable you to take a photo without turning on your flash, which creates a harsh, unattractive light. Be selective when you use this tip, though. You don’t want to aggravate your fellow diners with your cell lights. After all, it isn’t a concert. Therefore, use discretion and get your shot as quickly as possible, then put your phones away. Obviously, if you are at home, move your plate to wherever you can achieve optimal lighting. Think about props when creating the perfect food photo. Beautiful, aesthetically interesting plates, bowls or wooden boards are wonderful. Garnishments like herbs and spices are superb and imperfection is key. Add dollops of sauce, grains of salt and don’t over perfect the photo. Crumbs often add a sense of authenticity to your photo. Be on the lookout for interesting props you can use at second-hand markets and yard sales. You will be surprised what will clean up and look amazing in a photo. When photographing food at home, it is a good idea to lay out any props you plan to use before cooking your food or plating it up at the very least. Food goes from fresh, smoking, sizzling and appetizing to looking tired quickly. You have a small window in which to act. Keep fresh herbs on ice or in a frigid location until you are ready to start shooting. You might assume the only way to photograph food is from straight above. However, this is a stylistic mistake. Instead of being tied to this one angle, branch out a bit. Try meeting your plate at a 30 to 45-degree angle. One way to make a photo of food look more natural is to make it look slightly imperfect. Take your fork and scoop up a piece of that delicious pie, but leave the fork with the still steaming food on your plate. Wad your cloth napkin up alongside your plate. Make it seem as if you were in the middle of eating and were interrupted and this was the photo that captured the moment. If you have done all you can to prepare but still the color wasn’t perfect for your photos, you can use a color correcting app post-production. You can tweak your images warmth, color saturation, brightness and more. 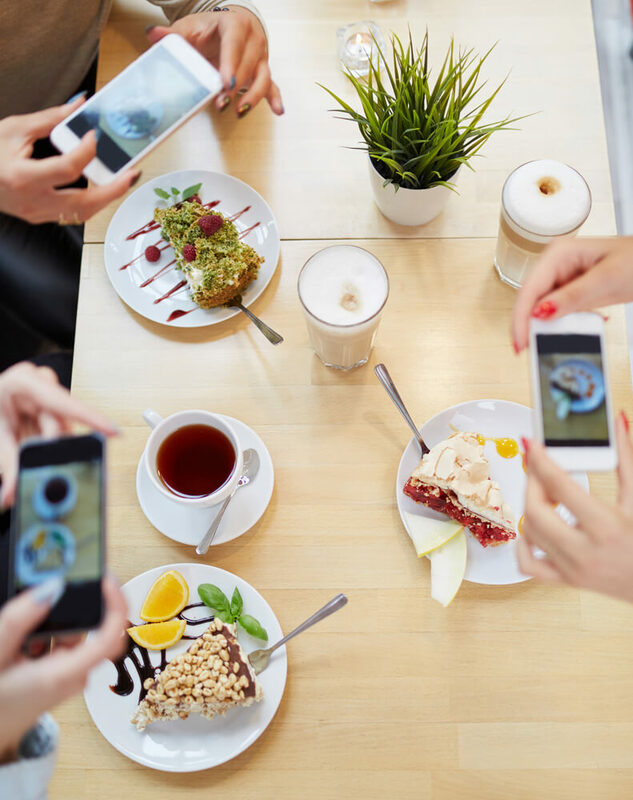 The tips above will help you create the most beautiful food photos you have ever wished for, perfect for sharing on Instagram.